Goats are the ultimate gift of gratitude and respect. California psychologist Diane Raleigh never expected to have five goats in a remote village in northern Tanzania. 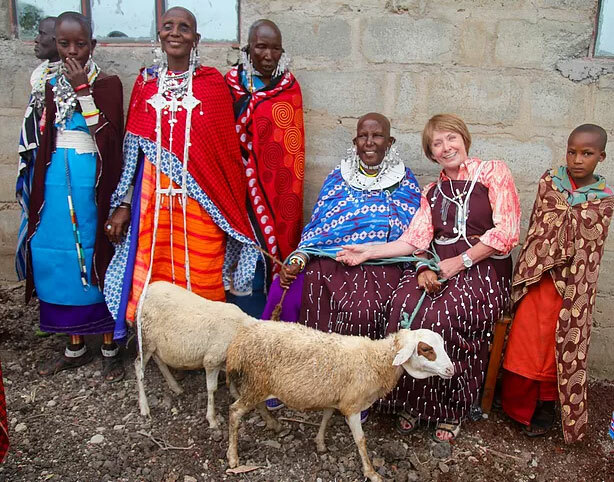 But because of her life-transforming efforts on behalf of the Maasai population there, “Mama Diane,” as she’s called, was given the goats, the ultimate gift of gratitude and respect. Raleigh, a force of nature with a seemingly endless supply of energy and determination, has rallied support in countless ways to bring the first-ever running water and health care to the isolated Olmoti community, home to about 1500 Maasai. Raleigh is the founder of the Olmoti Clinic, which besides offering basic medical care has changed countless lives with its eyecare program treating overflow crowds of Maasai for trachoma, cataracts and other debilitating vision illnesses. The clinic’s success speaks to one of Raleigh’s greatest missions – achieving sustainability through consensus building. From the beginning, she found ways to instill a real sense of ownership of the clinic within the community. Working with a local midwife, Mama Yaya, Raleigh involved local village leaders and regional government and health officials. She instigated a community board with members selected by the Maasai themselves to voice concerns to the government and to take up projects at the clinic. Raleigh also formed the Olmoti Trust, a board that can handle financial matters and liaison to the government. Because board members understand the Tanzanian system as well as the Maasai people and their needs, the Olmoti Clinic has thrived. Raleigh isn’t new to service in remote areas of Africa. As one of JFK’s early crew of Peace Corps volunteers, she founded an orphanage in Owerri, Nigeria that stands to this day. “I got busy with my practice and raising my kids, but I always knew I would need to so something again,” she said.